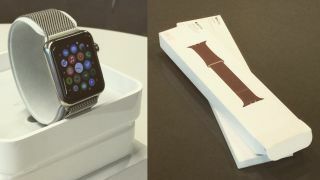 Apple Watch unboxing videos and photos are creeping onto the internet, even though the official Apple Watch release date is still a few days away, officially set for Friday, April 24. The iPhone-compatible smartwatch has begun shipping to its earliest adopters, who were charged the hefty Apple Watch price on credit and debit cards just yesterday. In advance of the end-of-the-week release date, the first Apple Watch unboxing video popped up on YouTube, giving everyone a peek at what the stainless steel watch packaging. This particular order came the Milanese Loop, one of the classier-looking Apple Watch bands. Of course, it costs $649 (£559, AU$949) for the 38mm size pictured. The band by itself is just $149 (£129, AU$229). The very first unboxing actually came to us in picture form via Instagram, Facebook's photo-filter friendly app that didn't even exist when Apple launched it last product category. Featured in the three photos, first spotted by 9to5Mac, is a 42mm stainless steel Watch. It boasts a larger touchscreen size and slightly longer Apple Watch battery life. It too came with the mesh stainless steel Milanese Loop band and there's also a brown leather strap that is consistent with the Watch's leather buckle design. The image captions were full of information before the photos were pulled. "As much as like the leather, the stainless steel strap still feels (and looks best) on the wrist," reviews the user. He also dishes on the steel Watch and classy-looking Milanese Loop, saying, "Weirdest thing I've messed around with in a while. Feels and worked a whole lot better than I thought it would. Now I got something to think about." Everyone should be able to figure out whether or not this unboxing is the real deal come Friday, when the Apple Watch ships to everyone else - barring shipping delays. Reportedly high Apple Watch sales have pushed new orders back as far as June, so unboxing videos and photos like this are probably the closest some get to opening up the new wrist-worn gadget.